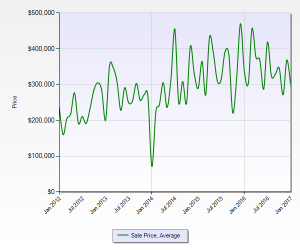 How is the real estate market in Peyton, CO? As of September 15, 2017, it is a HOT seller’s market unless your home is priced above$500,000. • 12 homes are currently available for sale Peyton. They sit on lots that range from 4 acres to 36 acres. Listing prices are start at $269,000 and go up to $793,000. The sizes range between 1,296 square feet to 4,291 square feet. Many of these homes have barns and shops. One even has an indoor arena. This particular home sits on 10 acres and is priced at $639,000. 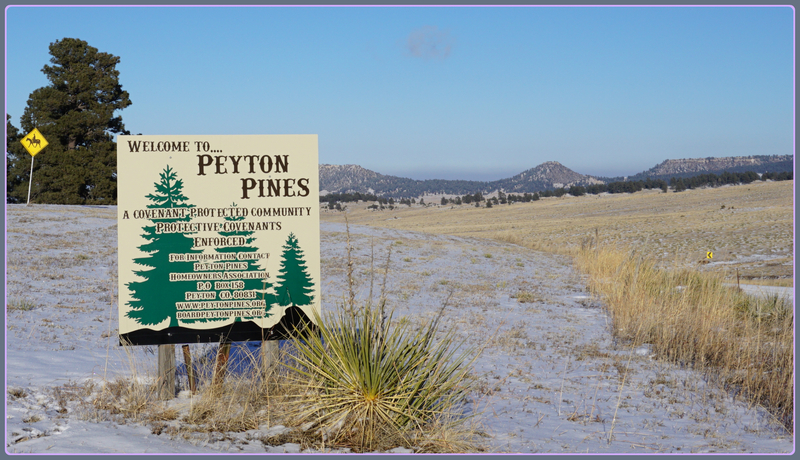 • 7 homes in Peyton have contracts pending on them. 4 of these 7 homes owners received acceptable contracts in 4 or 5 days. • 41 homes have sold between January 1 September 15, 2017. Sales prices have ranged between $100,000 and $750,000. 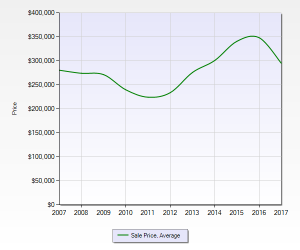 The average price has been $359,639. If you have any questions or if you would like to list your home, please feel free to email me at Sondra@haydenoutdoors.com or call 719-761-6272. 4 homes are available in Peyton. They sit on lots that range from 5 acres to 74.5 acres. Listing prices are start at $390,000 and go up to $875,000 for the home with 74.5 acres. 7 homes in Peyton have contracts pending on them. 14 homes have sold between January 1 and March 10, 2017. Sales prices have ranged between $100,000 and $473,000. Horse owners will love the selection of homes with land that is zoned for horses. 3 of the 4 homes that are available to purchase have barns that could be used for storage or fixed up for horses. As of today, Saturday February 18, 2017 – buyers have five homes in Peyton in “active” status to choose from. Active status mean that there is not a sales contract pending on the home. The prices range between $390,000 for a 5 bedroom, 3 bath home that is situated on 5.34 acres at the low end. The high end list price is $875,000. That one is a nice log 1,535 square foot log home on 74.5 acres. The log home has 3 bedrooms and 2 baths. 12 homes in Peyton in have contracts pending. As of today, Friday, February 10, 2017 – there are seven homes on the market in Peyton that buyers can select from. Four of the seven have either a barn or a loafing shed that could be suitable for horses. The prices range between $194,900 and $875,000. The most expensive place is on 74.5 acres. The others are on lots that range between 5 acres to 40 acres. Eleven homes in Peyton already have a contract to sell on them. If you want to sell a home in Peyton, it is a great time. Prices have been very good compared to previous years. This chart shows a dip in prices for January 2017. I don’t think this represents any thing to worry about. First, an older manufactured home was sold for $100,000 to the person that had already been living there. This reduced the average sales price. It is also highly possible that the $100,000 sales price will be one of the lowest for all of 2017. 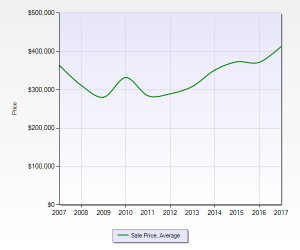 For example, if we look at sales in Peyton Pines alone, the sales price trend does NOT show a dip in January 2017. Instead it shows the highest price levels in years. Home inventory is low. In other words, the buyer demand has been so strong for homes in Peyton, that there is not a lot of homes on the market that has not sold. In January, 2016, there were only 8 homes for buyers to choose from. That low inventory of homes in Peyton has to bring a smile to a seller in Peyton in knowing his home is a prized possession to a potential buyer and could solicit multiple offers for this category of property. I liked how you also explained how average sales price could be affected by an outlier property. Great statistical data to learn about this area. Thank you for your comments. 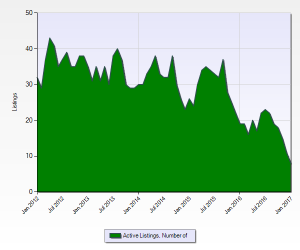 This is a really good time for sellers to list their homes in Peyton. The market is good. The weather has been cooperative, so buyer prospects can enjoy going out searching for their next home. This time last year, we kept having big snow storms that slowed people down.